Tunnels have been in the news recently. Whether it is underground structures designed to bring terror to Israelis, infrastructure dug deep into the earth providing revolutionary transport between cities or our “peace partners” losing their way on a track to nowhere, this week has provided us with a bounty of examples. When tunnels are constructed it usually takes a long time before one actually sees the results. Months, sometimes years of underground rumbling and activity may pass before the surface is broken and all is revealed. Depending on the scope of the project there may be little indication of progress. Obstacles may be encountered and detours may become necessary but at the end of the day the objective is reached. Tunnels which are constructed from both ends always meet in the middle, something impossible here as will be made clear. For a long time now the terror group Hamas has been spending millions of foreign aid and endless hours in creating terror tunnels from Gaza into Israel and also into Egyptian territory. These underground highways are built by teams of workers from children to adults. Beavering away day and night these engineering projects are designed solely to facilitate smuggling of weapons and ammunition as well as the transportation of terrorists. Designed to surface in the midst of Jewish communities, whether it is schools, homes or clinics, the aim is to enable Hamas and associated groups to murder, kidnap and maim as many Israelis as possible. Like so many threats we face, no amount of warning and evidence of evil intentions seems to interest the international community in the slightest. 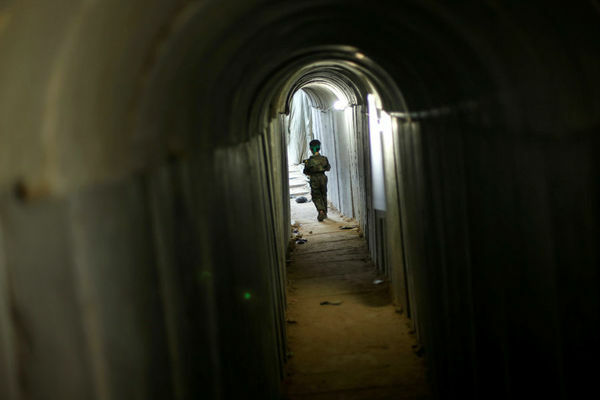 Tunnels dug under UNRWA schools or originating in mosques, hospitals and private homes elicits nary a peep from those who regularly condemn and censure Israel at the United Nations. Politicians and religious leaders who foam at the mouth over Jerusalem’s status as our Capital are conspicuously silent over the continual digging of terror tunnels. The misuse of aid money to finance terror and perpetuate a refugee problem which could have been solved decades ago is glossed over. In fact the European Union joined by Scandinavian countries and even Australia and New Zealand make every effort to increase foreign aid without demanding accountability and a renunciation of support for terror and a cessation of hate education. Every time Israel takes steps to eliminate the tunnel threats it is faced with international outrage. In recent weeks several of these underground highways of death have been detected and destroyed often along with murderers lurking in them. Finally it has been announced that Israeli ingenuity has produced an underground version of the famed Iron Dome defence system. Apparently it is now feasible to discover these tunnels before they can be utilised for their deadly purposes. We have been told that by the end of the year Israel will be able to thwart these threats and thus save countless lives. It is a shame that so much money has to be spent on developing technology to defeat those intent on murdering us rather than spending it on solving health and social problems. In the face of a tsunami of international hypocrisy and surrender to immoral double standards, that unfortunately is the price we have to pay. No doubt those promoting terror will scream loudest and as every tunnel is destroyed with terrorists entombed we can expect further condemnations issuing forth from all and sundry. Talking about screaming and condemnations brings me to the Oscar-winning performance featuring Abbas and a cast of supporting actors which premiered in Ramallah this week. There, on full display and in front of the international media, the head of the Palestinian Authority and the Palestine Liberation Organisation, loudly proclaimed for two full hours a litany of lies and falsehoods using a script which could have been written by Joseph Goebbels himself. The poisonous puss of a denial of Jewish history and delegitimisation of a Jewish connection to Israel has bubbled away and burst forth at regular intervals. Buried like deep tunnels, many have been fooled by a façade of normalcy on the surface but in actual fact the refusal to accept a legitimate Jewish presence is at the root of the conflict we face. It has nothing to do with borders, land, settlements or refugees and everything to do with plain old Jew hatred. >Having rejected any Jewish connection to Israel and renounced the USA as a partner Abbas is now demanding that the EU step in. What is it he wants from them? More money of course, to replace any funds withheld by the USA plus recognition of a non existent State and support for full UN membership. Will he get this? Without a doubt they will fall into line as though nothing has been spouted. Once more the corrupt PA and its hangers on will be rewarded thus validating every bit of incitement and distorted rhetoric blaring forth from Ramallah. Proof that this is liable to occur is contained in the announcement by the EU and Norway that they are convening an emergency meeting to push for the 2 State solution at all cost. Tragically European countries and others are not the only ones trapped in this tunnel of deceit, unable to break out of their tunnel vision which encourages continual strife and mayhem. In other words we are asked to repeat the same mistakes which resulted in violence and murder. Precisely by not focusing on what is said the leader of the opposition has given the Palestinian Arabs a license to delegitimise and a green light for the UN to condemn us. The week has ended with another tunnel and Jerusalem connection. Our Minister of Transport participated in the first trial run of the new high speed railway connecting Tel Aviv to Jerusalem via tunnels and bridges and slated to open in time for Passover. Initially running one train per hour, passengers will be able to travel free for the first 3 months. Gradually, frequency will increase with both tracks being utilized. As explained by the Minister, for the first time in 3,000 years pilgrims visiting Jerusalem during the Festival of Pesach will be able to reach the Capital from the coast in half an hour. Now that’s great news. In summary we can safely assert that there is indeed a light at the end of the tunnel. For Hamas and associates the light is not an oncoming train but an Israeli missile heading their way. For Abbas and friends the light they can see is red signifying the end of the line. For travellers to Israel’s Capital the light is green giving the go ahead for full speed development and sovereignty.